ABBAS’ CHIEF NEGOTIATOR: ISRAEL TO BLAME FOR BREAKDOWN IN TALKS……. – The Tundra Tabloids……. ABBAS’ CHIEF NEGOTIATOR: ISRAEL TO BLAME FOR BREAKDOWN IN TALKS……. Abbas and pals want to de-Jew the areas of Judea and Samaria.That’s apartheid. Palestinian negotiator Nabil Sha’ath, PLO Member Hanna Amireh skeptic about resumption of talks without extension of West Bank construction freeze; US Mideast envoy, EU foreign policy chief set to arrive Thursday. RAMALLAH, West Bank — Palestinian officials on Wednesday expressed skepticism about the resumption of peace talks and signaled they would accept nothing less than an extension of the West Bank settlement construction moratorium ahead of the scheduled arrival of US Mideast Envoy George Mitchell and European Union Foreign Policy Chief Catherine Ashton to the region on Thursday. Veteran Palestinian negotiator Nabil Sha’ath said Israel should be blamed for any breakdown of the negotiations if it insists on expanding settlements on lands claimed by the Palestinians for their state. Previous Post Previous Post BIG GOVERNMENT FINLAND: STAMPING OUT SMOKING WITH MOST DRACONIAN ANTI-TOBACCO LAWS……. Next Post Next Post THE COUNTERJIHAD CALENDAR RECOGNIZES TODAY AS MOTOON DAY……. When in doubt, blame the Jews. 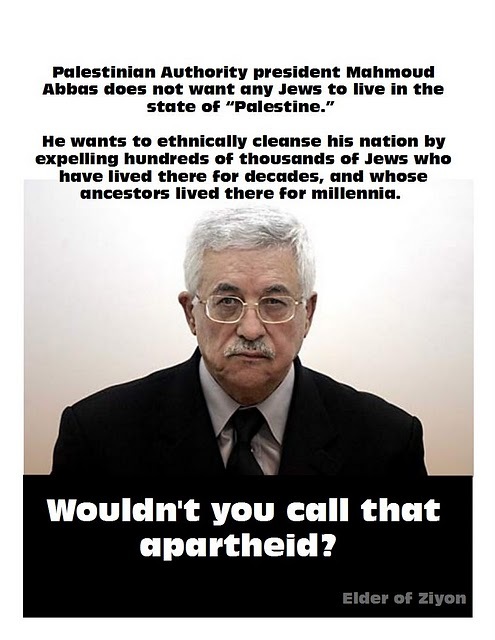 I wouldn't call the Abbas commercial's thesis "apartheid". It sure is stupid. And let's face it! If Abbas can't live with Jews as friends and neighbors, then he's hardly ready for peace. They are for a Jew free area in what's planned for another Arab state. That's it in a nut shell.